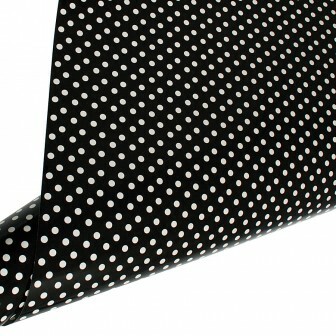 This beautifully designed Table Runner / Gift Wrap ~ Black Creme Polka Dot is a modern and fun pattern wrappng paper featuring a creme polka dot design on a black background. A great option for adding some interest to your party table or dessert buffet. Made from glossy 115 gsm paper, this luxury weight paper is extremely durable and can be wiped down making it a great choice for a table runner. At 3 meters in length, it can be cut to fit a table and the remaining paper used to wrap gifts. hiPP donates 5% of the wholesale price from your purchase to Variety – The Children’s Charity, helping making a difference to the lives of children in need.